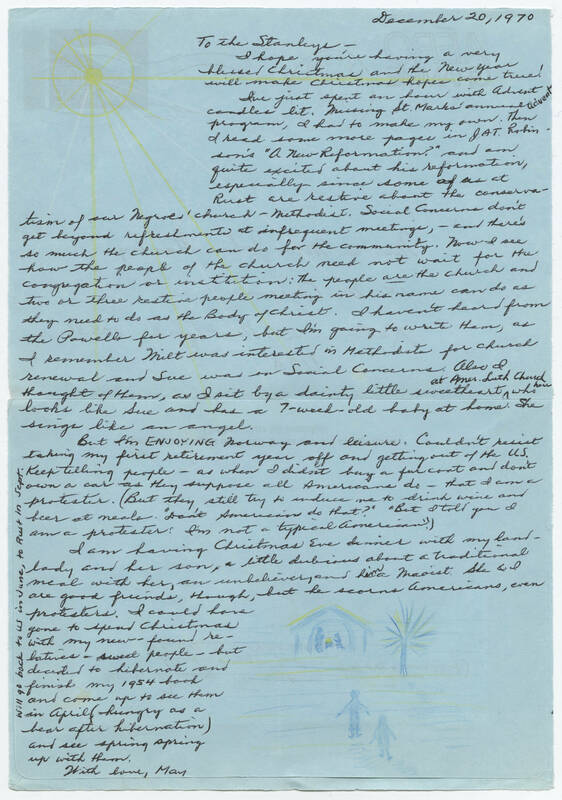 December 20, 1970 To the Stanleys- I hope you're having a very blessed Christmas and the New Year will make Christmas hopes come true! I've just spent an hour with Advent candles lit. Missing St. Marks' annual Advent program, I had to make my own. Then I read some more pages in JAT. Robin-son's "A New Reformation?" and am quite excited about his reformation, especially since some of us at Rust are restive about the conserva-tism of our Negroes' church- Methodist. Social Concerns don't get beyond refreshments at infrequent meetings, - and there's so much the church can do for the community. Now I see how the people of the church need not wait for the congregation or institution: The people are the church and two or three restive people meeting in his name can do as they need to do as the Body of Christ. I haven't heard from the Powells for years, but I'm going to write them, as I remember Milt was interested in Methodists for Church renewal and Sue was on Social Concerns. Also I thought of them, as I sit by a dainty little sweetheart, ^at Amer. Luth Church now who looks like Sue and has a 7-week-old baby home. She sings like an angel. But I'm ENJOYING Norway and leisure. Couldn't resist taking my first retirement year off and getting out of the US. Keep telling people- as when I didn't buy a fur coat and don't own a car as they suppose all Americans do- that I am a protester. (But they still try to induce me to drink wine and beer at meals. "Don''t Americans do that?" "But I tell you I am a protester: I'm not a typical American.") I am having Christmas Eve dinner with my land-lady and her son, a little dubious about a traditional meal with her, an unbeliever, and him a Maoist. She and I are good friends, though, but he scorns Americans, even protesters. I could have gone to spend Christmas with my new- found re-latives- sweet people- but decided to hibernate and finish my 1954 book and come up to see them in April (hungry as a bear after hibernation) and see spring spring up with them. With love, May Will go back to US in June, to Rust in Sept.